Ziktomini and JonnyREcco qualified for the Nationals! dignitasBlinG and Phamut qualified for the Nationals! rANDY and EGDeMusliM qualified for the Nationals! Ourk and Moomin qualified for the Nationals! RazerBlader and Yarakyo qualified for the Nationals! Shibbxyz and VYEStone qualified for the Nationals! Simba and HighGaiN qualified for the Nationals! DeMoN and Reno qualified for the Nationals! Want to relive the StarCraft II World Championship Series United Kingdom Nationals? Download the replays and you can! The next step of the Intel Extreme Masters is Guangzhou, China with $31,800 in prize money. Sign ups are open for the first stage of IEM 7 Guangzhou European qualification. Blizzard’s StarCraft II World Championship Series United Kingdom Nationals are just a few days away and we’re proud to announce two new sponsors of the event – Twitch.tv and PNY! Peripheral manufacturer Tt eSPORTS sponsors Blizzard’s StarCraft II World Championship Series United Kingdom Nationals. The first round matches for the StarCraft II World Championship Series United Kingdom Nationals have been determined. BlinG and DeMusliM could meet in round 2, as could JonnyREcco and Ourk. We’re excited to announce that Nick “Tasteless” Plott and Dan “Artosis” Stemkoski will provide live commentary for the StarCraft II World Championship Series UK Nationals at BAFTA, London. The pair are known from their position as the commentators for GSL in South Korea and have worked on a number of prestigious events around the world. They will be joined at the StarCraft II World Championship Series UK Nationals on June 30th and July 1st in London by Paul “ReDeYe” Chaloner who will host the event. The eighth StarCraft II World Championship Series UK Qualifier saw 71 gamers battle it out to earn qualification for the StarCraft II World Championship Series UK Nationals, which will be held in London on June 30th and July 1st. 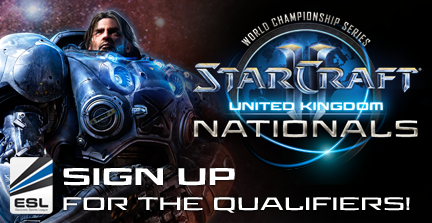 On Sunday June 10th at 18.00BST, UK gamers will have their final opportunity to qualify for the StarCraft II World Championship Series United Kingdom Nationals, held in London on June 30th and July 1st, where $10,000 prizemoney is on offer! Watch on ESL UK TV2! Watch on ESL UK TV!